On June 4, 2008, Fr. 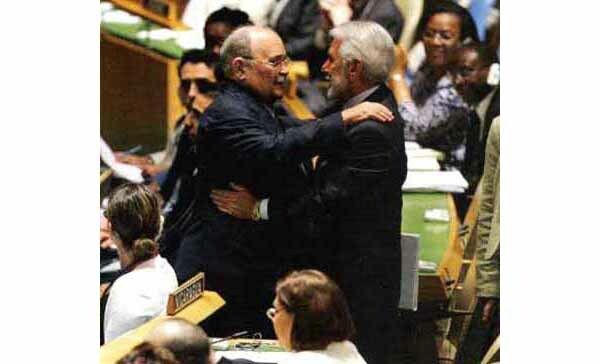 Miguel d'Escoto, a partisan of Liberation Theology, was chosen as President of the United Nations Assembly. D'Escoto is a former Foreign Minister of the Daniel Ortega government in Nicaragua from 1979-1990. Ortega and d'Escoto took power through guerilla warfare against the government that evolved into a civil war. They followed an openly Marxist orientation. In 1990 Ortega was defeated in the elections. In 2006 he return to power thanks in great part to the support of the Cardinal of Managua, Obando y Bravo, who presented Ortega as a moderate Catholic. 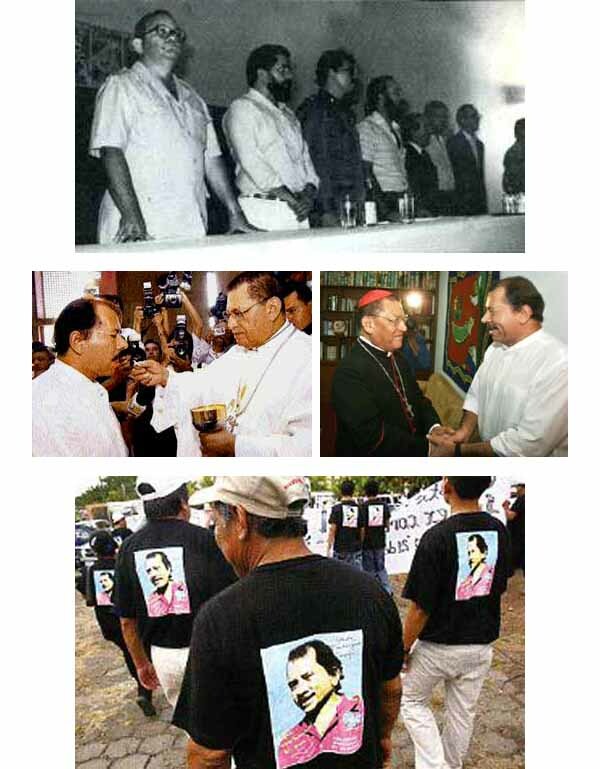 As soon as Ortega was elected, however, he again embraced the same Communist creed. Instead of objecting to that stance, the Cardinal accepted a place in the government as President of the Peace and Reconciliation Council. The name of Fr. Miguel d'Escoto was proposed to the UN by Daniel Ortega and accepted by acclamation of the 192 members of the Assembly. His inauguration for the one-year-term took place on September 16, 2008. Above at left, Fr. d'Escoto being congratulated after his election. Below first row, at a conference of the Christian Base Communities in São Paulo, Brazil, in 1980 - from the left, d'Escoto, Lula (Brazil's present president), and Ortega. Second row left, Card. Obando y Bravo gives Communion to Ortega during his electoral campaign; at right, he greets Ortega after his election victory. Third row, working people - generally conservative - gave their vote to Ortega based on the support of the Cardinal of Managua. Fourth row left, at his inauguration, Ortega, in the center, raises his hand in the clenched-fist Communist salute along with Evo Morales, president of Bolivia, and Hugo Chaves, president of Venezuela. 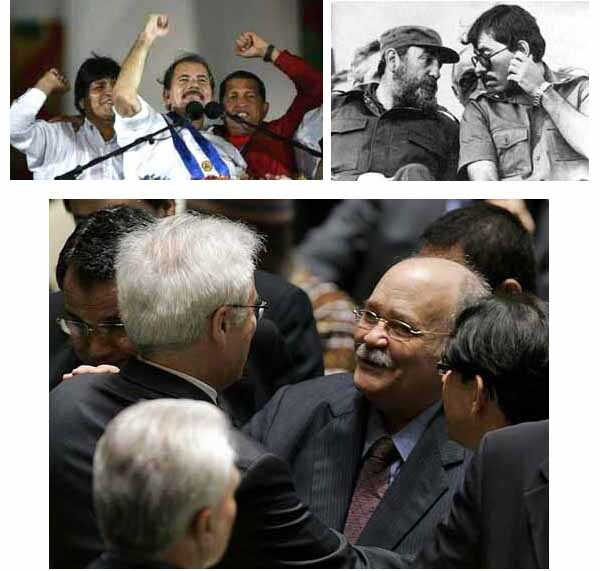 Thus he reveals today the same Communist stand that he demonstrated before; at right, Ortega receiving instructions from Castro in the '80s. Let us see how Fr. D'Escoto translates his Liberation Theology into the working agenda of the UN.